MISTC was developed to be easy to use; still, it helps to have some basic directions. The following was written to give new users of MISTC a quick start. After downloading your MISTC client, you will bring up MISTC through the Learning Management System Moodle. Just log in to your course and use the link there to connect to the live session you want. You can include the MISTC tools that you want for your presentation from the buttons on the top of the tool window. As you can see below, you are given the Floor Control and the Whiteboard by default. You may add the Recorder, the Player and/or an extra Projector display by using the buttons. A guiding principle of MISTC is that good audio is essential. The Speak Freely audio tool is one of the best anywhere. We have added a compact interface with all the controls in one easy place. It is set up to start sending when you take the floor or, for a student, when you hand over the floor. The gray buttons at the top of the control are for when you are using the recorder in standalone mode. You should always run a sound test when you connect. To run the sound test, use the Sound Test button to capture and play back a few words. The speaker slide sets the listen volume. The mic slide sets the talking volume. The bouncing bar shows the speech level. Both the slides should show green blocks up to the yellow block in the bouncing bar during the sound test. Normally, you should click on REQUEST FLOOR in the Floor Control to speak; but when you already have the floor, you can use Stop to mute sending and Send to start it again.You can tell the mode of the audio by the color of the status description in the interface. AGC means automatic gain control, which is another way of saying it takes care of itself. But there is one part of audio where it cannot do the work for you: unless the students in the classroom have microphones you will need to REPEAT THE QUESTION asked, so the online students know what was asked. You may want to deputize a student in the classroom to help you remember to do this. As a controller, you can take the floor away from the current floorholder (the one whose cell is red) by clicking Request Floor. In most cases when you are teaching, your students will not have this option. When a student clicks Request Floor you will hear a chime and a red ATTENTION sign will appear on the whiteboard. The cell of the requesting client will turn pink. To give that student the floor, you can click on the pink cell. Remember, as controller you can reclaim the floor any time. In the conference mode, the first user to claim the floor, will be designated the default floor holder. Thus, when the floor is released, it automatically returns to the default floor holder. If the floor is released by the default floor holder, then no one has the floor. The default floor holder policy is not currently used with breakout rooms. If a student disconnects from MISTC the corresponding cell will turn gray. The multiple whiteboard entry feature allows the instructor to input from a whiteboard on a computer other than the teaching computer. 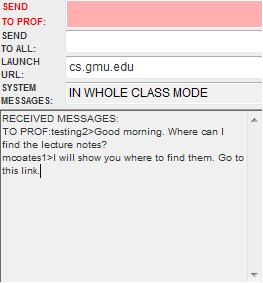 This feature gives the instructor the ability to prepare a special presentation and bring it to class. This is especially useful when the Window Import function is used (see below) to capture the display of an application running on the second computer. Whatever is entered into the whiteboard on second computer is displayed on all the other whiteboards in the session, despite the fact the second computer is not floorholder. To initiate the second whiteboard, the instructor must login to Moodle using a second account, connect to MISTC, and take the floor once from that computer and then yield the floor, after which the whiteboard on that computer will remain able to enter graphics in the MIST/C session. The floor control has a built-in chat feature. This is handy when someone's sound is not working or you do not want to make noise. It also lets students who are not set up for sound send questions and comments. Another input space illustrated above and worth noting is LAUNCH URL. When you type a URL here, a browser will launch on each MISTC desktop and attempt to load the URL from the Internet. Although you have no control over the format (browsers vary widely), this can be a very timely feature. As long as your microphone is working, you can pretty much forget about the audio. You need to focus on the other critical component of teaching: graphic presentation. The MISTC whiteboard is a very flexible tool that will let you present your slides and annotate them. Everything you see on the whiteboard is also sent to all other whiteboards in the session within a few seconds. The buttons across the bottom of the board are those that manage whole pages. The options here cover anything from photographs, to PowerPoint and LaTeX slides, to contents of any window active on the teaching computer, to plain old typing and handwriting. The buttons on the upper right edge of board are tools for annotating slides and blank pages. You can enter text (T), draw lines, arrows, rectangles, and ellipses, or write freehand (for this, a tablet input is recommended). If you include an RTF file (saved from Powerpoint) matching the PDF, the whiteboard will use the slide titles when it divides the multipage PDF into individual slides. You can import up to 999 slides. Blank Page gives you a fresh whiteboard to draw, write, or type on. 'PrintScreen' on your Windows keyboard before you click it). Go To Page produces a list of all your pages, so you can jump to one. Prev Page steps back through the previous pages you have imported. if the present slide is the last one imported. Erase when pressed, explains how to erase an annotation. Config when pressed, a menu of possible configurations for the annotation appears. Convert when pressed, provides easy slide conversion (see 'Convert Slides button' below). Use this when a hard copy of an annotated slide is needed. About WBD displays the max slide file size and notes about the programmers. At the lower right edge of the whiteboard is the Convert Slides button that will accept a multi-page file and break it up into the single-page PDF or JPEG files used with the whiteboard. It also will perform other handy tricks. See MISTCDATA/INFO/CONVERT-INFO.txt for details. Convert Slides supports only static slides.It will not reproduce PowerPoint effects such as zoom-in and fade-in. In addition, the 'transparent' feature is not usable. The maximum file size for a slide in any format is 128KB. This limit is set inside MISTC and can be changed if slow transmitting modem links are not used. In the case of JPEG slides, the whiteboard will accept a larger file and attempt to reduce its size by recoding to a lower quality JPEG. The whiteboard will attempt to convert oversize PDF and PNG files to JPEG for this purpose. To use Open Office for conversion, simply install version 3 of Open Office. With Open Office, you can convert .ppt, .pptx, and .odp files. Convert Slides does have one annoying requirement, if you are using Powerpoint: you must install the HP Color LaserJet 8500 PS driver in order for it to work. See Windows file C:\Program Files\MISTC\CONVERT\CONVERT-INFO.txt. However, you do not need this driver to convert using Open Office or to use 'Convert Slides' on a multiple PDF file. Lastly, a note about the part of the whiteboard that is not user-proof: it cannot keep you from pointing at the screen when you should be using the arrow. Those online do not see you point. Here again, you might ask an on-the-ball student to remind you: DO NOT POINT AT THE SCREEN. Another tool in the MISTC teaching setup is the control for the recorder that makes your class available at all hours of the day and night. The Record Control is so simple that there is not much to say about it. You can pause the recorder for a break. When you do this, another helpful sign will appear until you start it again. When you stop the recorder, the file is terminated. But you can choose to append to it when you start again on the same day. 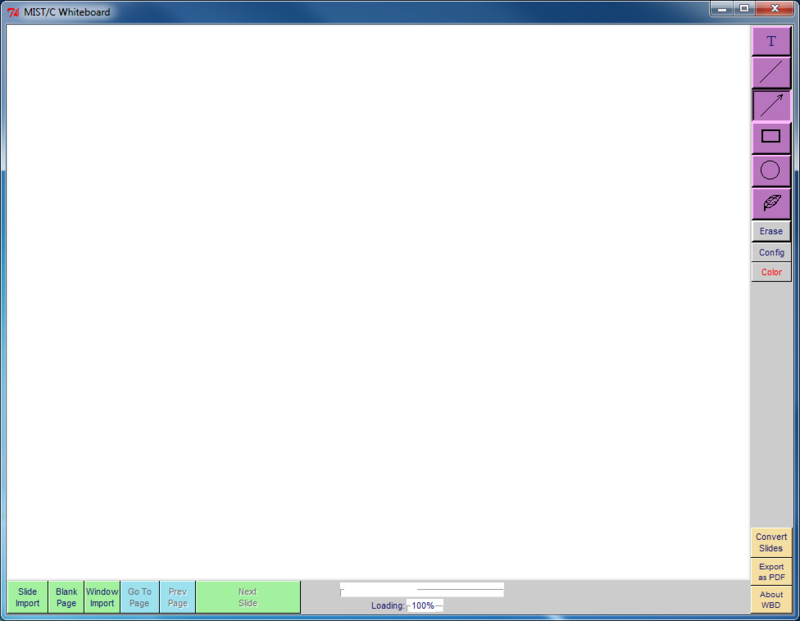 A separate recording (without pauses) is made on the server when MISTC is so configured. If you have instructor privileges, you can download that recording using the button Download Recording in the Floor Control panel. You can change any part of the filename except the nwr extension as long as the name is less than 40 characters long. 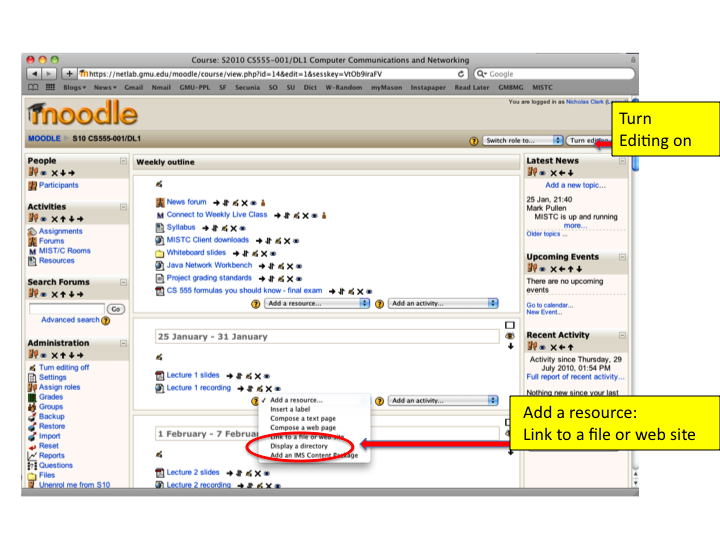 You can then upload it to Moodle, where it will be available to your students. MISTC uses a great Internet video tool called VIC. Because video eats up computer and network capacity, we set VIC for slow frame rates and small pictures, even though it is capable of good quality video. This is consistent with the fact that most students report they gain very little educational value from a talking head. We generally do not record video, for the same reason. But it is there for students with broadband Internet, and many do connect. 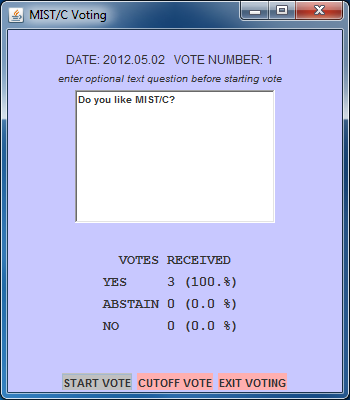 MISTC provides for taking a vote among the students logged into a live session. Using the "Voting" link under the REQUEST FLOOR button, you can initiate and tally the votes. MISTC will handle Application Launching for the student users. Window Import is useful for capturing many visuals, but some applications produce rapidly moving images that simply can't be transmitted in real time. Examples are video players and graphics programs. MIST/C lets you teach with those by launching the application on users' desktops, under your control as presenter. More information on Application Launching. While a MISTC classroom session is in progress, MISTC can break the online group into as many as nine subgroups. Subgroup members can communicate among themselves, using the audiographic features of MISTC. Breakout subgroups may be saved and restored in subsequent classroom sessions. More information on Breakout Groups. The MISTC client stores MISTC data files on its computer. For Windows computers, other than Windows VISTA, the data files will be found in My Documents/MISTCDATA/ and for MacOS X, Linux and Windows VISTA computers the data files will be found in Documents/MISTCDATA/. RECORDINGS/ contains output from the MISTC recorder and input for the MISTC player. MISTCDATA also contains the file OFFLINE.nwm described below. 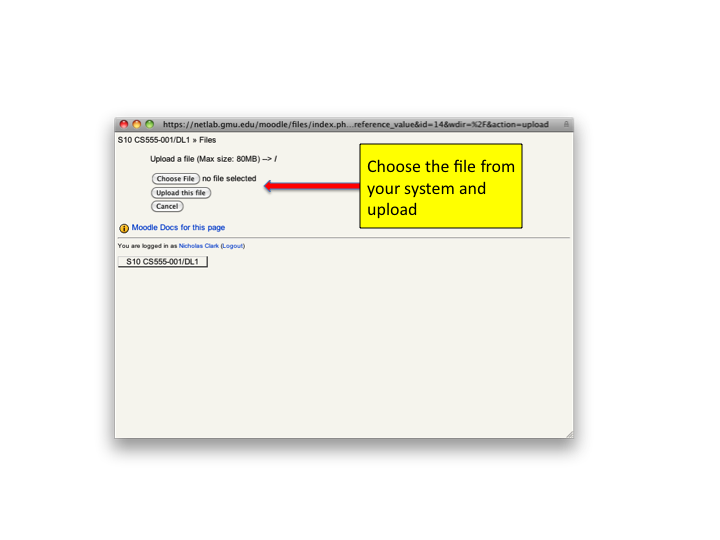 The following illustrations show how to upload recordings and slides from the MISTCDATA subdirectories to your Moodle course. First, turn on editing and add the resource "File" in your course home page to the session where the link should appear. Next, name your link as it will appear on your course and click on the "Choose or upload a file" button. 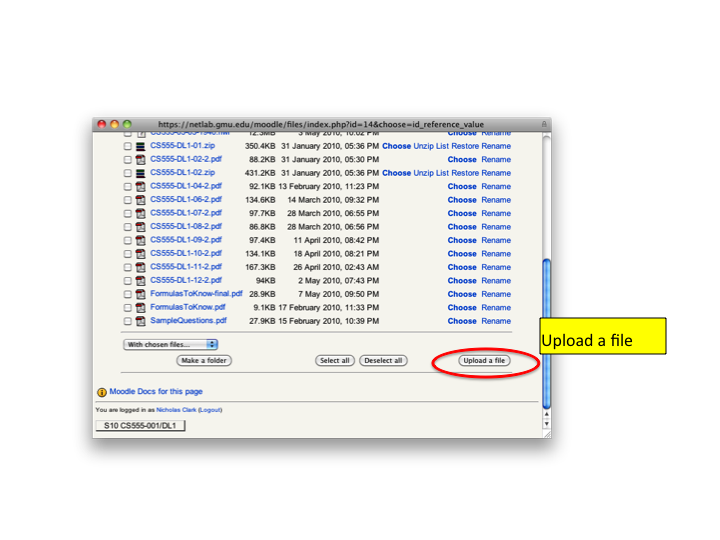 If you are uploading a new file, just click the "Upload file" button on this page. 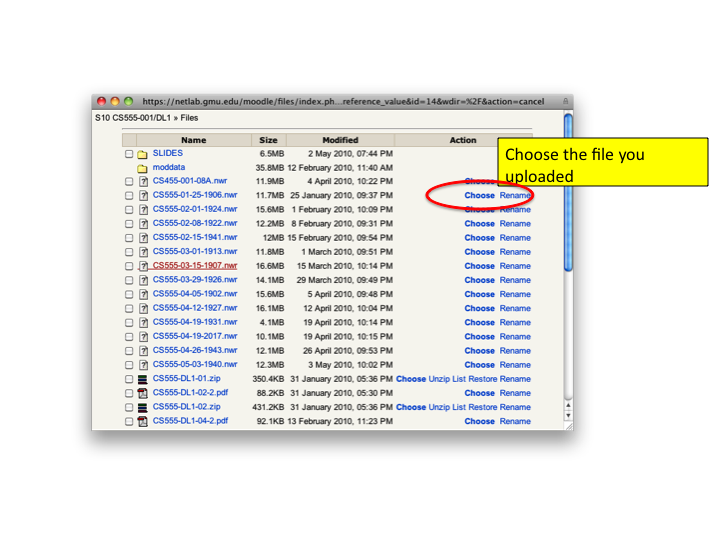 choose your file from the list, then click the "Upload file" button. then upload it using these buttons illustrated below. Then you can choose the file from the storage list and click the "Upload file" button. 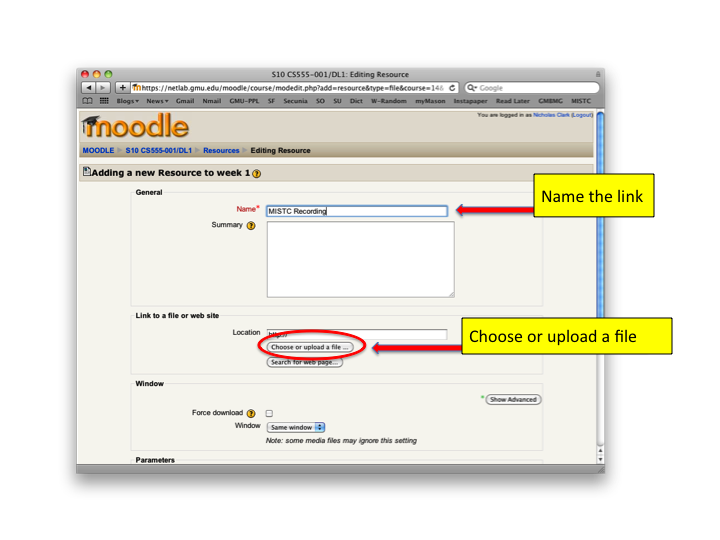 The following illustrations show how to upload recordings and slides to a folder created in your Moodle course. First, turn on editing. If you need to create a folder, add the resource "Folder" in your course home page. Otherwise, choose the folder already in your course home page. Next, click on the "Edit" button for the folder. And then the "Add" button. Now, select your file to be added to the folder. 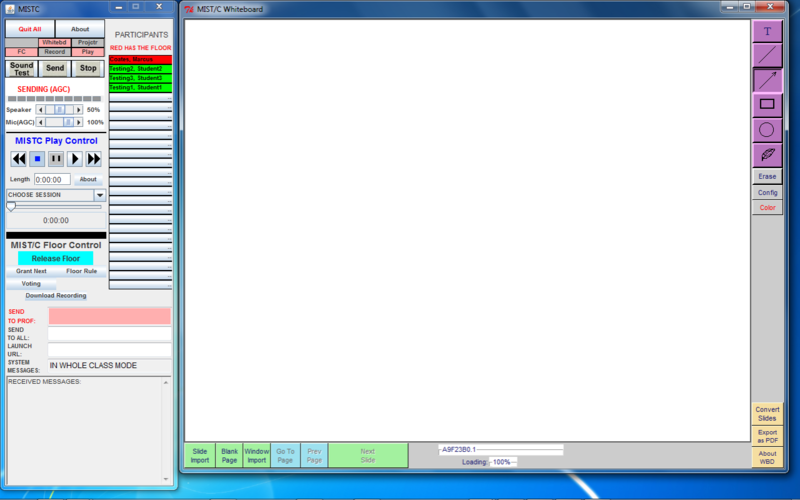 After starting the MISTC client, click the RECORD button at the top of the control box to open the "MISTC Record Control" window. (See Record Control above). Click the record indicator to begin recording. To end the recording, click the stop indicator on the record control. Your recording will be saved in the RECORDINGS folder within the MISTCDATA folder on your computer. For Offline recording, you must click SEND to start the audio capturing sound (when you are online, REQUEST FLOOR does this automatically).